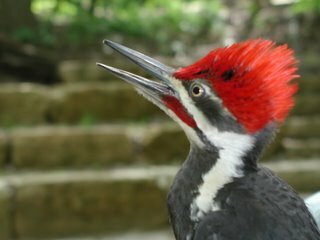 I took this great photo just the other day of a pileated woodpecker. Pileated are the largest woodpecker in Minnesota and, if you don't count the Ivory Billed Woodpecker, they are the largest in North America. These guys are huge. They have a wingspan of 29 inches! This one got caught in a bird mist net at the nature center and a bird bander is actually holding the bird. My telephoto lens isn't that good! Catching a pileated in a mist net isn't unheard of but it is notable. They caught one last year as well but it had been three years before that when the last one was caught. You can tell this is a male because of the bold red line under his eye. Both males and females have the red crest but the line is unique to the males. Though clearly alarmed (his crest is sticking up) he was pretty docile in the hand. That huge beak could do some serious damage to your hands but luckily he took it all well. I thought about a LiveJournal account. At least to post and read. I've been on blogger for five years now so it seems weird to move.